She Power has been planned to encourage and support creativity in a way that produces income-generating products and new skills for their girls as well as unleash the creative expression, new motivation and an “I care” within their spirits. There are a variety of challenges that exist for youth in rural areas such the students of Mlindazwe High School in Mgotjane, Eswatini. 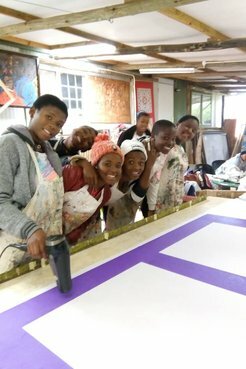 The rural nature of these communities in conjunction with a high school curriculum that does not include coursework in the arts, results in a lack of exposure to art, creative expression, education and employment opportunities in the creative arts. The rural lifestyle limits their vision of future possibilities. They naturally connect to a future of homestead living; such as planting, harvesting, cooking, cleaning and raising children. It’s easy for them to choose a life that is familiar and comfortable without considering the many more opportunities that are available to them in addition to family life. Thanks to their sponsor; The Mbabane Rotary Club, the conference will introduce the girl child to income-generating crafts and skills in a hands-on workshop style conference. She Power’s aim is to leave lectures behind and let girls learn by doing. The conference focuses on building three parts of the girl child; a powerful mind, powerful body and powerful future. They will do this by offering workshops such as; beading, empowerment bracelet making (to track menstrual cycles), reusable pad making, self-defense class, financial literacy (earning She Power cash for completing each workshop then using it to invest in additional materials for their future business), t-shirt up-cycle into a conference bag, talent show, clothing swap and more. In November 2018, as a pre-She Power creative opportunity Mlindazwe high school orchestrated a She Power lihiya designing contest. 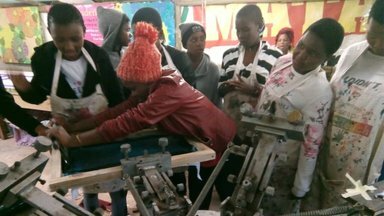 The winning design would offer the group a chance to travel to Yebo Art Reach in eZulwini to be a part of the printing process. When asked, “What do you see as the biggest challenge of the students at Mlindazwe high school?” their teacher, Phendulile Mlangeni stated, “The students do not care. There is no motivation to learn.” It was from this comment and in partnership with Peace Corps, Tammy Scully, that ignited events such as; She Power Conference being held May 2-4, 2019 at the Mhlambanyatsi Inkhundla. She Power has been planned to encourage and support creativity in a way that produces income-generating products and new skills for their girls as well as unleash the creative expression, new motivation and an “I care” within their spirits. Approximately 30 girls from the high school gathered in the science lab to hear about this unique opportunity. Girls then divided themselves into groups of 3 to 4 girls and began designing, as a group, their own personalized She Power lihiya. Out of the 10 groups present that day, only three group submitted, totaling 10 girls. 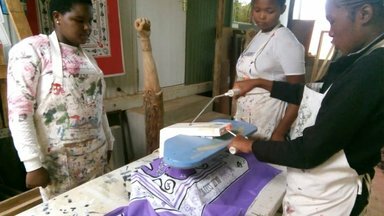 To open up the Yebo Art Reach opportunity to more girls in the community, the teachers decided to bring all 10 girls together to create a final design. During this design phase they were encouraged to put their rulers away, relax their drawing hand and practice moving more freely with less straight lines. Two meetups later, the final design was intact. This design is the one you are seeing today. “We could not peel these girls away from the workshop. They almost refused to stop working! I have never seen these students this motivated. Something has woken up inside them. Now if only we could wake up all students in eSwatini in this way – it would change the atmosphere and future of the entire Kingdom.” says, PCV Tammy Scully, who lives and works in Mlindazwe. 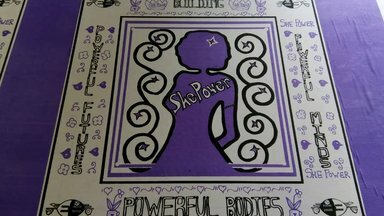 Hopes for the Future of She Power: Locally, Mlindazwe high school has plans to start the She Power Creatives club that will meet weekly to continue encouraging the girls to expand their creative abilities and generate income along the way. 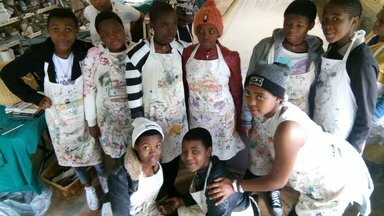 We will be looking to partner with interested artists around eSwatini to share their artistic skills with our students as well as, use local teachers, students and community members to bring their own artistic ideas to the club. The larger dream of She Power is to share the program (lihiya contest/printing, conference and clubs) across all schools under all Tinkhundla in the Kingdom of eSwatini. What does the phrase She Power mean to you? 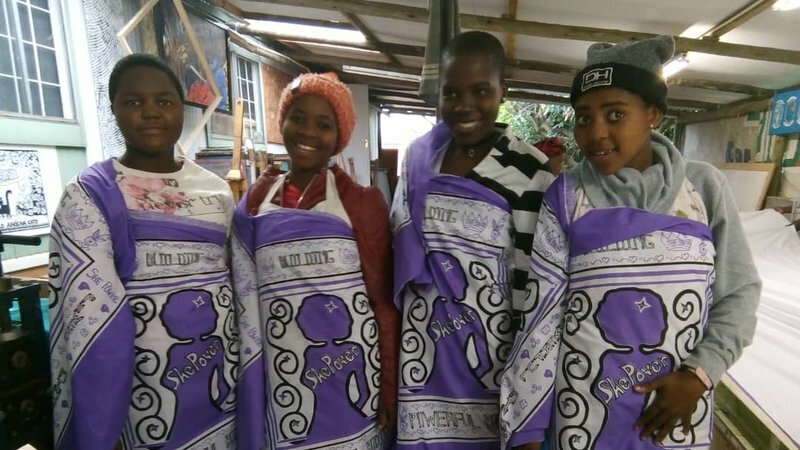 "As girls we can live without the help of men and we can change the world and even boost the economy of the country.” Says, Senamile Dlamini and Nosihle Malinga, two of the 10 lihiya artists from Mlindazwe high school." Tammy Scully is a Youth Development volunteer in the Kingdom of Eswatini. She has her Bachelor in Business Administration and is currently a Master's International student pursuing her Master is Social Work at the University of Michigan - Ann Arbor. She loves all things spiritual, creative and authentic.